Sharon Kelly is an attorney based in Philadelphia. She has reported for The New York Times, National Wildlife, Earth Island Journal and a variety of other publications. 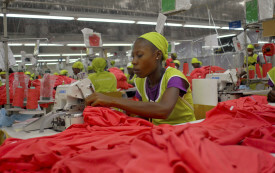 Do You Know Where Your Government Uniform Was Made? Despite some laudatory local and state efforts, taxpayer dollars are still being used to purchase clothes made in sweatshops.